Green homes incorporate environmental considerations and resource efficiency into every step of the building and development process to minimize environmental impact. The design, construction, and operation of a home must focus on energy and water efficiency, resource efficient building design and materials, indoor environmental quality, and must take the home’s overall impact on the environment into account. All green homes begin with Energy Star Blue. Since 2001, all Riverview Estate homes have been Energy Star certified. Since 2010, all single-family homes at Riverview Estates are certified green. What goes into a green home? Many of the energy-efficient qualities of a green home are easy to spot. Appliances, windows, and water heating systems will likely have Energy Star® ratings. The home may also include efficient lighting fixtures and bulbs. Renewable energy sources further decrease the overall energy consumption within the home. Fixtures and appliances such as low-flow showerheads, faucets, and toilets, and Energy Star dishwashers and washing machines all conserve water. Programmed rainwater collection systems and hot water recirculation systems also save water. The home should contain renewable materials, including rapidly renewable wood species such as those found in many of the engineered wood products throughout the home, and recycled-content materials in carpets, tiles, and concrete formulations. The heating, air conditioning and ventilation system (HVAC) must be appropriately sized for an efficient and properly ventilated home. Fans in the kitchen and bathrooms release stale air to the outside. An HRV (Heat Recovery Ventilator) further exchanges indoor air for fresh outside air while retaining the energy in the exhausted air and transferring it to the incoming unconditioned air. Low-VOC paints, finishes, and wallpapers may also be used. In a Green home, care should be taken to preserve trees and other vegetation native to the area. Landscaping should contain plants that are appropriate for the climate and grouped according to water needs. Driveways and other impervious surfaces should be reduced as much as possible and may be composed of gravel, permeable block pavers, grids, or other permeable systems. 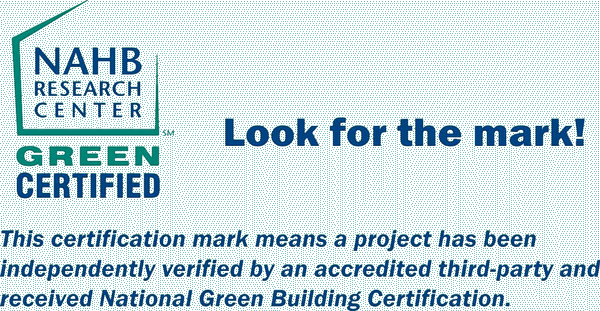 If you are in the market for a green home, look for the Green Certified mark issued by the NAHB Research Center. It is the homeowner’s guarantee that the home was built according to one of the levels of green certification outlined in either the ICC 700-2008 National Green Building Standard or the NAHB Model Green Home Building Guidelines. 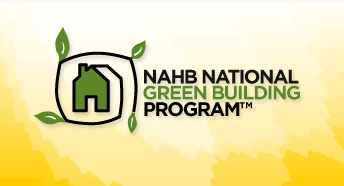 The NAHB Home Innovation Research Labs is the sole certifier recognized by NAHB’s National Green Building Program. High-efficiency Air Conditioning 14.5 S.E.E.R. Enjoy incredible year-round comfort, and savings on your energy bills for years to come! A Segal & Morel Energy Star home is built with energy-efficient systems and measures and certified by the Environmental Protection Agency (EPA) to be typically 20-30% more energy-efficient than a standard home. The Energy Star program is part of the larger EPA program developed to promote energy-wise products and programs that help consumers save money while protecting the environment. Owning a Segal and Morel Energy Star Home means you are saving money, increasing the comfort of your home, and protecting the environment. How Does a Segal and Morel Home Get Energy Star Certified? Homes achieve this level of performance through a combination of energy-efficient improvements, including Effective Insulation Systems, High-Performance Windows, Tight Construction and Ducts, Efficient Heating and Cooling Equipment, and Energy Star Qualified Lighting and Appliances. To ensure that a home meets Energy Star guidelines, third-party verification by a certified Home Energy Rater (or equivalent) is required. This Rater works closely with the builder throughout the construction process to help determine the needed energy-saving equipment and construction techniques and conduct required on-site diagnostic testing and inspections to document that the home is eligible to earn the Energy Star label. Energy Cost Savings – Offering an average savings of $50 a month, a Segal & Morel Energy Star Home can help you free up cash for buying that new sofa or qualifying for a higher mortgage. In addition, higher quality equipment lasts longer and costs less to maintain over time. All-Season Comfort & Indoor Air Quality – Tight construction, higher insulation levels, and upgraded windows add up to a home that feels warmer in winter and cooler in summer. You will also experience less noise, fewer drafts and hot/cold spots, less airborne dust, and reduced exposure to pollutants. Improved duct systems also provide balanced airflow to all rooms for superior comfort. Builders receive incentives to offset some, if not all, of the added costs for these upgrades. Special Mortgages – Building a Segal & Morel Energy Star Home gives you access to national Energy Star Mortgage Programs that reward energy efficiency. You can take advantage of lower interest rates, extra cash-back after closing, the ability to qualify for a larger mortgage, discounts on closing costs and reduced loan origination fees. Higher Resale Value – The upgrades found in a Segal & Morel Energy Star Home result in years of lower utility bills, easily boosting the resale value of your home when it comes time to sell. Protecting the Environment – Segal & Morel Energy Star Homes use less energy, helping to reduce the amount of air pollution created by household consumption. It’s a natural way to help the environment and one more reason to feel good about building a Segal & Morel Energy Star Home. Learn more about our construction advantages today. Visit the Energy Star website.